Mac OS X users: I love Camera Helper, the one-trick memory-card downloader from Script Software. Since I prefer not to use iPhoto (its incomprehensible mandatory file storage system puts me off — I don’t dislike the interface or tools), Camera Helper saves me the multi-step work of detecting, downloading, and deleting image files from my camera. It doesn’t do anything else, but it’s handy to let Camera Helper do these errands. 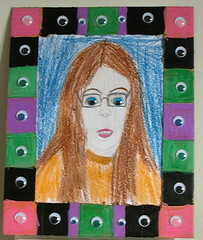 Pippa gave me this self-portrait yesterday evening, executed to correspond to one that Nate made long ago. Nate’s portrait included a frame with plastic toys glued on around the image; Pippa noticed the other day that they made a vaguely facial pattern themselves, picking up and reinforcing the depiction of Nate’s face. Evidently the idea of “eyes” on the frame stuck with her, as this features googly-eyes all around the frame, and Pippa’s eyes are likewise googly. This afternoon, Philippa and I rolled down to the Field Museum to take in the Jacqueline Kennedy exhibit. Pippa is an avid student of biographies, and earlier she devoted particular attention to First Ladies. You may remember her Jackie Kennedy balloon at right (included a matching Jack on the reverse of the balloon). When she took out the library books on Jackie Kennedy Onassis, the librarian asked her whether she was going to the exhibit at the Field Museum. We hadn’t been aware that there would be such a thing, so the question became a provocation for this afternoon’s Field trip (so to speak). We made it to the Field just in time for our 1:30 ticket pick-up (note of advice: Buy tickets in advance online. We coasted past a line that would have lasted a half-hour or so of standing in a winding queue near the chilly vestibule), though the signage for parking at the Field leaves a tremendous amount to be desired. We thus took a scenic tour of the promontory on which the museum, aquarium, and planetarium are situated, only eventually finding our way to the parking garage. Tickets for special exhibits such as this are exorbitant, though if you make it a doubleheader (“Jackie Kennedy and Machu Picchu! Such a deal!”) you save a lot over the cost of separate visits. We didn’t have the time and energy for that, so we contented ourselves with offering our organ donations to get into just the Jackie Kennedy exhibit, then wandering around the rest of the museum as Pippa’s spirit moved her. The Kennedy exhibit touched me more than I anticipated. I have almost no interest in fashion history, so the array of hats and dresses blurred before my eyes. The letters, films, and memos, however, bespoke a personage of remarkable brilliance of a sort that has to a great extent faded from public awareness, to our impoverishment. Be it granted that the exhibit set out to cast Ms. Kennedy [Onassis] (and Jack) in the best possible light — the discourse of Presidency that the Kennedys enacted diverges sharply from recent presidencies, even though particular policy mistakes may fairly be compared back and forth. The overwhelming impression from the artifacts assembled here pointed toward a literacy and depth I have missed for decades. In this context, Jacqueline’s cultural alertness, multi-lingual fluency, remarkable taste (not only in clothing, but the arts in general) evoked in me a pang of unexpected nostalgia, but even more profound admiration of this extraordinarily articulate, elegant, accomplished woman. Her life of privilege certainly made possible opportunities and achievements to which she’d never have access had she been born with similar gifts in rural Appalachia. At the same time, the braying golden asses to whom the Tutor so relentlessly directs our attention represent only one of the fruits of aristocracy; and given the benefits of privilege, Jacqueline Kennedy seems not only not to have wasted them, but rather to have extended herself to make her advantages into benefits for everyone, the true noblesse exemplified by the philanthropists who hang around at GiftHub). All that being said, boy! there were a lotta dresses. Pippa examined them carefully, read the descriptions (with designer, occasions on which JBK wore the dress, critical analysis of the design), attended to the film clips, soaked up the whole display. When we got home and she told Margaret what we’d seen, she freely supplied details and recounted anecdotes as though she’d been there. Afterward, we strolled at length through the natural history displays (she gleefully spotted a family of moose, whom she associated with Margaret’s father, and of geese, which she claimed as her own totemic creatures). She surveyed the owls that her great-grandfather loved to etch, and studied the informational panels dedicated to Sue, the Field’s unique Tyrannosaurus Rex, with all the intensity that I used to indulge at the Peabody Museum. After Jim McGee said such a kind thing about my Law of [Non-]Simplification, I have to spread around some of my new organizational-theory whuffie, pointing it at Merlin Mann. You may think Mann has all the whuffie anyone could need, with countless tech hipsters eating out of his folders, but as I was drowning myself in an RSS subscription backlog, I spotted a gem of a comment from him. In response to a story about Apple picking up the tab for a reservation he and some friends made, Merlin notes that “Things like this make me feel they’ve got elves all over making smart micro-decisions. . . .” That’s it — “smart microdecisions”; that expresses in two words what I have always aimed at in administrative functioning. When you make smart microdecisions as an administrator, experience suggests to me that other people start making smart microdecisions, too. The administrative ecosystem begins to work in your favor, good sense starts showing up at the roots, and the tree flourishes. Now I have a phrase for it — thanks, Merlin. I haven’t complained about my exercise regimen lately — for a subtly important reason. While Margaret was home in December, I fell out of the habit of exercising. Unfortunately, the internal somatic good-will built up by my commitment to health, vigor, and ascetical self-discipline did not carry me over through the holidays, so I lost much of the ground I had gained by the fall’s grueling exertions. Beginning today, I hope that I will resume regular enough exercise that I may end up complaining about it online again. [Later:] And Jeff Ward, too. Relative to the Seabury site redesign, I just visited two of our site authors who use PCs, and discovered (to my dismay) that Explorer doesn’t like our two-column layout or the character entity (⊕) that I used as a dingbat . I now have to figure out what went wrong with the dimensions of the columns such that the left hand column gets pushed to the bottom, and I have to replace the character entities with some other thingy (I s’pose either a GIF or a plus sign). I also want to be able to share with them the joys of newsreaders and blog entry clients, but I don’t know the best (and the free) PC applications in those categories. It looks as though Jeneane is having a good time with Qumana — I’ll investigate that for starters. It was very cool to be able to show them that Feedster already knew about Seabury’s RSS feed. But first I have to fix the columns, sigh. Short on sleep, headache, and — writing workshop. I hope I behave myself adequately. I’ll bet you’ve never attended a Canadian dissertation defense at which dooce was chair of the committee and Keanu Reeves served as a special guest outside examiner! Well, in a dream from which I just woke up, I did — so there! I got to the defense a little early. It was held at Heather’s house, and she was showing me around. The house was set on pronounced hill, so it had a view of the neighborhood, which was flooded at the time (surprisingly so; Heather hadn’t noticed how the water level had risen in the recent rains, but two-story houses at the base of the hill were under water). Heather, of course, praise Jon’s judgment for selecting so marvelous a house. The defense started, and it was actually more like a critics’ get-together. The dissertator had evidently prepared an art project as her thesis, and everyone (a very well-attended defense, perhaps because of the guest star, but I saw some of my former colleagues from the biblical faculty of Princeton Seminary there, too) was milling around, waiting for someone to speak first. When the hors d’oeuvres ran out, I headed back to my office, a rather more spacious habitation than my present phone booth, and was settling down to ignore some work when a clump of attendees, knocked at my door. I invited them in, and a stream of black-turtlenecked hip critics flowed in, occupying every available seat and a bunk above a file cabinet (that is a very cool idea, by the way, and I may look into having a bunk bed over my files cabinets if I move — I could use a place to nap). I didn’t know all these people very well, so there were lengthy futile introductions, and just as we were getting around to discussing the dissertation defense we’d just seen, along with a project for indexing the works of Bob Newhart, somebody began deliberately scooping out the grounds from my coffee maker and spilling them on the floor. It turns out that this guest (who was the one lying on my bunk) was not one of the dissertation critics, but was just a wanderer who had stumbled in, drunk. I dragged him off the bunk, so that he landed in the midst of the grounds. At that, I woke up, and felt the imperative urgency to record the weirdest dream I’ve had in ages. Oh, And. . . . In the next few days, the new Seabury web page will go live. It’s not finished — Connie and Micah and I want to fiddle with it in various ways — but within a day or so, it’ll be close enough, and the lovely thing about designing with CSS is that we can do the fiddling in situ. The home page is dead; vive l’acceuil! At the end of each term, or each Adult Ed gig, the odds favor the likelihood of somebody coming up to me and asking, “Can you recommend any commentaries on that?” Add that to the number of times I try to whip up a starting bibliography on a given text for my New Testament classes, and you get a relatively strong case for my building up a repository of my recommendations relative to secondary literature on the New Testament. So this morning I started a blog whose entries will all be topics in the field of New Testament studies, the contents of which will be bibliographic suggestions along with casual evaluations of the works in question. This way, I’ll be able to leave it open for comments (so that visitors can make helpful suggestions) and hyperlink to online resources. This overlaps, to some extent, with Mark’s wonderful work on the NT Gateway — though with a bloggy difference, since over the long run my pages aim not for comprehensiveness, but for partiality. The NT Resources page will run under Moveable Type, but I won’t be treating it as a daily-update site. I’ll flesh out and edit entries as I see fit, and probably won’t multiply entries once I cover the canonical books and some pretty obvious thematic headings. I’m starting with the Epistles, as I’m teaching through them this term. I’ll put up a page for each unit as I encounter them, but I won’t have the time to put together a rich overview of the literature right away. The advantage of using a CMS for this work, though, is that I’ll be able to return to each topic as I have time, or as I run into a work that particularly impresses me. In this way, I’m putting my time and energy where my mouth and pen are. If (as I submitted) the future lies with seeded-search rather than a filtered-links/gateway approach to online research, then it behooves me to post my biblical scholarship links; indeed, if I get up the energy (in other words, when I have something more important to do, for which this provides a congenial distraction), I may even code in vote links. I’m happy enough with the spreadsheet functions in AppleWorks as it stands, but it’ll be hard to resist buying iWorks, just for the Pages function (I’m a sucker for word processors; what can I say?). Still, it would be a vast improvement if Pages could read and write an XML-based format, especially Office Document format.